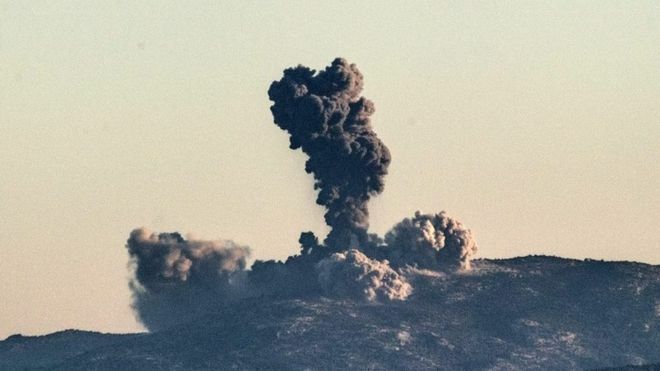 On the heels of a threat to invade Kurdish Afrin, Turkey Saturday launched air strikes against the northern Syrian enclave. Turkish prime minister Benali Yildrim said the operation had begun to “destroy the YPG and PKK.” Convoys of US-trained and armed Kurdish fighters from other parts of northern Syrian were seen heading in force to the beleaguered Kurdish enclave, allowed to pass through by the Syrian army on orders from Assad. Piss on the dictator erdogan And his supporters. TRUMP YOU BETTER SO SOMETHING BOUT THIS AND NOT LEAVE THE SYRIAN KURDS IN THE COLD LIKE YOU DID THE PESHMERGA…..
Long live the Kurds! Down with Pigdogan and his facist regime. Turkey should get the stuffing kicked out of them, they should pay for slaughtering the Arminian nation.May the world see Erdogan hanging. I don’t think that Turkey should be a part of NATO. A withdrawal from NATO probably is not coming but an ejection from from it may..by then too late as the cementing between They and Russia..will be concrete. The Silk Road corridor will continue ..All the parties including us.. should all be building bridges to it, not burning them.